This article describe the design, construction, measurements and receiving experiences made with such “exotic” antenna that fully covers ELF – SLF – ULF – VLF - LF and part of the MF. See Table 1 at the end of the article. Connecting this antenna to a PC with a Sound Card and Software like Ciao Radio, http://www.antennex.com/Sshack/ciaoradio/ciaoradio.html, it is possible to receive, analyze and demodulate any ELF – SLF – ULF – VLF signal up to 24 kHz. A lot of antennas for the VLF and ULF use have been developed so far. A virtual plethora of examples can be found at www.vlf.it. The antennas at these frequencies are vertical polarized in 99% of the case. The mode of propagation is the Surface Wave where the vertical wave could travel. Every horizontal component is mainly cancelled from the anti-phase reflection of the ground. Horizontal polarization looks used only to receive the “ seismic precursors “ and the signal coming from the sky wave of the auroras that have random polarizations. Most of these antennas are based on the use of Short Monopoles (with or without capacitive hats) or Small Loops as in Figure 1. Both of them are typically not tuned. The monopoles are typically connected to high impedance amplifiers and the loops are typically connected to low impedance amplifiers as in Figure 2. This allows these antennas to have very large bandwidth behaviour. The problem with the monopoles is that the ground system that recreates the lower part of the dipole is very “fuzzy.” This means that local currents induced from the main at 50 or 60 Hz and harmonics could easily flow into this “undefined “ part of the antenna. This reduces the possibility to shield the antenna from these high level fields from the main at 50 or 60 Hz and harmonics. One of the possibilities to avoid this is to use a short vertical balanced dipole as probe. To avoid the use of a balun made with inductive parts that will limit the bandwidth, at this frequency it is possible to use a differential amplifier in the so called configuration of “Amplifier for Instruments.“ The use of Operational Amplifiers allows a high level of peak to peak handling and of intermodulation immunity. Ra, that is the radiation resistance, is very low and tends toward zero while the frequency is decreasing and is in any case negligible with respect to Ri, that is, the input resistance of the amplifier. If we apply the Thevenin theorem transformation, we get the simplest possible circuit shown in Figure 4. Figure 4: Equivalent circuit of the antenna and input amplifier. The amplitude of the equivalent generator is decreased from the partition between Ca and Ci, but the equivalent capacitor Ct is the parallel of Ca and Ci. Ri and Ct state the lower frequency passband end, Fc. If Ri and Ci are larger, then Fc is lower. The first method does not have inconveniences, if not of physical construction. The second one could easily give micro phonic effects if the hats are not perfectly steady. The second one decreases the signal at the input (that in any case is typically is not so low). With these considerations, either method, or a mix of them, could be used to decrease the minimum frequency of the antenna till 5 Hz. The upper frequency will be limited from the operation amplifiers. With the use of a simple TL084 an upper Fc of 600 kHz was measured. Better operational amplifiers could increase the upper frequency if needed. The peak-to-peak handling could be increased using rail-to-rail operational amplifiers or increasing the voltage of the power supply. There are of course operational amplifiers with better noise specs than the common TL084. A good candidate could be the common TLC274. The basic electrical draw is showed in Figure 5. The full draw is showed in Figure 6 . Fig.6 : Full electrical draw of the Active Differential Antenna . The capacitance of a monopole dipole depends from the parameters and the formula showed in Figure 7. The capacitance of a Dipole is half of that of the monopole (it can considered as two monopoles connected symmetrically back to back). In the equivalent single-ended circuit the capacitance that we have to consider is exactly that of the monopole. Fig.7: Capacitance of a short monopole . If we want to have an idea of the capacitance of this antenna with some practical diameters, we can consider 2.5 cm and 30 cm that are the usable practical diameters that could be found on the market to build a self-supported dipole 2m long, made by wrapping an aluminium foil on a PVC pipe. Calculations give respectively a capacitance Ca of 15 and 46 pF. If we want to have more capacitance, the use of a capacitive hat looks unpractical. The capacitance of a hat that is 1x1m adds only 9 pF to the total capacitance. As we learned, the only easy way we have to have the passband flat down to 5 Hz on the lower corner is to add a capacitor in parallel to the dipole. Calculations we have done show that we need a total capacitance of 300 pF in the single-ended mode. A half value is needed in the balanced mode (between the dipole terminals), so a 150-pF capacitor will do the job in both cases, but it is obvious from Figure 4 that the antenna with the larger diameter will be more sensitive. Fig.8: Frequency response without the equalizing capacitance . Fig.9 : Frequency response with the equalizing capacitance . On the upper frequency corner, if we use the antenna only with a sound card, it is useful to avoid the possibility of overload or intermodulation from strong signals on the MW band. A value of 220pF will give a Fc = 26.8 kHz. Having two poles, the slope will be 12dB/octave. If someone would like to find the best differential balance to locally null as much as possible the hum at 50 or 60 Hz, could change one of the resistors of 27k Ohms connected to the pins 1,9 or 7,10 of the operational amplifier with a series of a resistors of 22k Ohms and a multi-turn potentiometer of 10k Ohms. Nulling has to be made with the antenna mounted in his place. The overall spectrum received is showed in Figure 10. The first part (till around 5 kHz) is fully filled with the industrial frequency (50 or 60 Hz) and his harmonics or switching spurs. 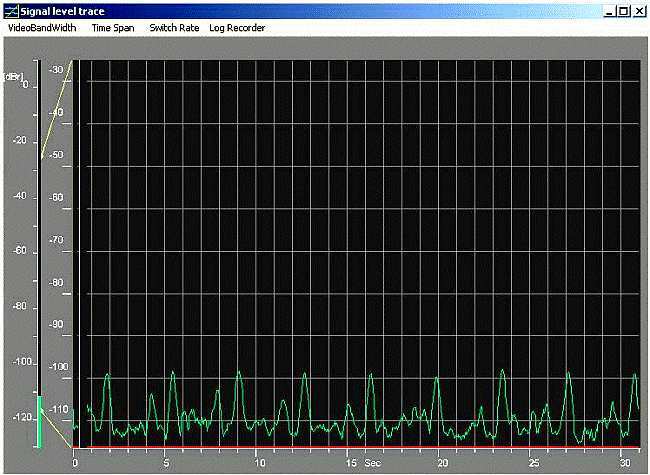 In the band 15-24 kHz, there are some strong signals very easy to receive. The first one of this is man made: the horizontal frequency of the TV sets. Please also note a strong carrier also at the horizontal frequency /2 with the same origin. 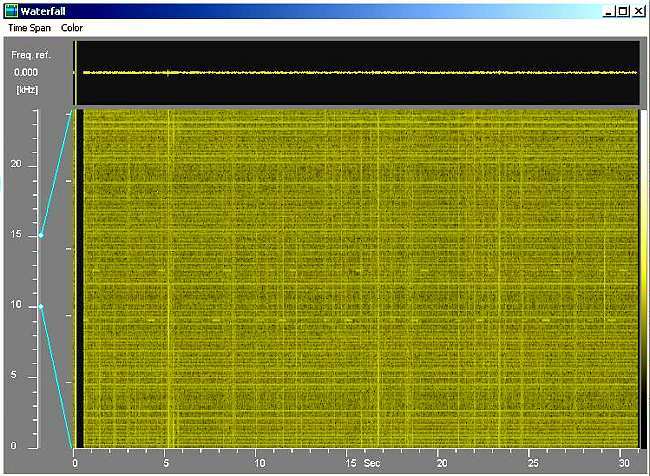 Fig.10 : Overall received spectrum till 25 Khz . Man made horizontal frequency of the TV sets marked. Note also the strong carrier at half the frequency . The other signals are generated from the Military Army and are modulated at 50 baud at: 16.5, 18.3, 19.6, 21.150 and 23,4 kHz. Other signals that can be currently received are the Russian Alfa Navigation System (call sign ZEVS) at: 11.9, 12.65 and 14.88 kHz. If you carefully see the spectrum, you can see regularly some carriers popping out from the noise. The best way to see them is to use the waterfall option of Ciao Radio as shown in Figure 11. You can recognize two of them on the same screen. 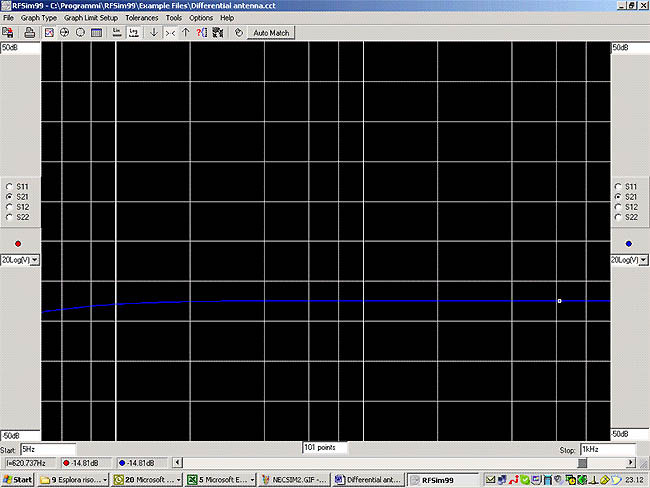 To tune one signal, narrow the filters and look at the amplitude of the signal as shown in Figure 12. Fig.11 : Two Russian Alfa Navigation System showed at the same time in the waterfall mode at 11.9 and 12.65 Khz . Figure 12: The amplitude of the Russian Alfa Navigation System at 11.9 kHz, recorded during the time. Transmission occurs around every 3.5 seconds. What I have built is showed in Figures 13 and 14. 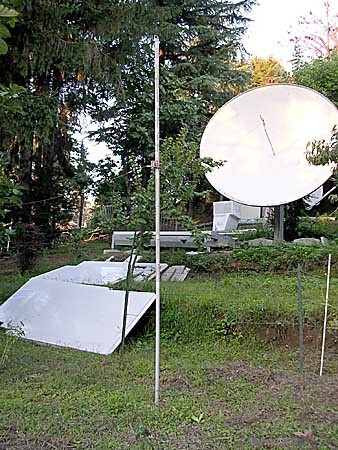 Please use it as a bad example of “how to build an antenna”…..I am typically lazy ….. in any case, it works ….. I was not particularly interested in the 5-50 Hz band, so for the moment, the element of the dipole was only 3mm of diameter. I am building now a new version, wrapping aluminium foil on a PVC pipe of 30 cm of diameter, for trying to receive on this band. My friend Renato Romero, IK1QFK, has reported to receive the Shumann resonances and the Russian transmission to submarines them with this setup. To power the antenna, I first used a 9V battery. Now I use a Phantom Power (like in the microphone systems). See Figure 15. To power the antenna , I have use at first a 9V battery . Now I use a Phantom Power ( like in the microphone systems ) . Fig.15 : ADA Phantom Power supply . 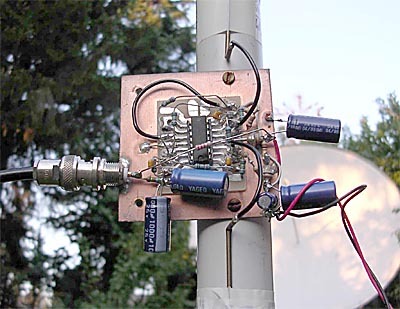 A simple and cheap antenna to receive ELF – SLF – ULF - VLF - LF and part of the MF signals has been reported. 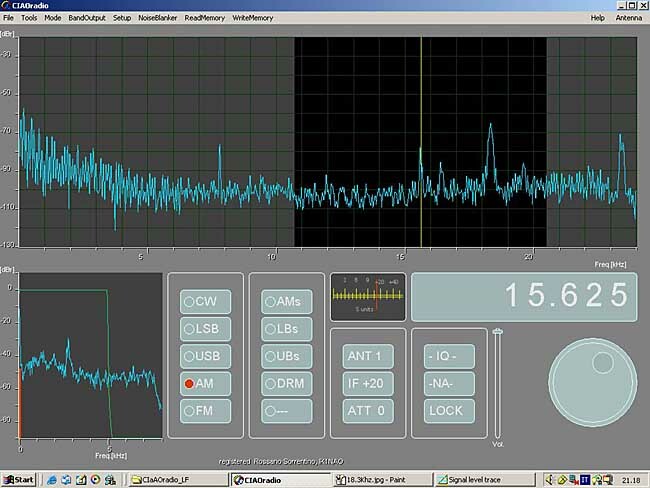 In conjunction with a PC with a Sound Card and the Ciao Radio Software http://www.antennex.com/Sshack/ciaoradio/ciaoradio.html, it is possible to receive, analyze and demodulate any ELF – SLF – ULF - VLF signal till 24 kHz. Welcome in this exotic world and have fun!